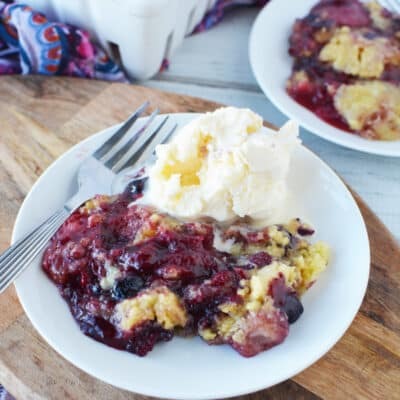 This crockpot cobbler is perfect all year round because during the summer we all crave fruit desserts, but in the winter we all look for something warm and hearty. It’s a win-win, folks! I love recipes that are semi-homemade – meaning that we get to use a cake mix instead of having to worry about starting from scratch. 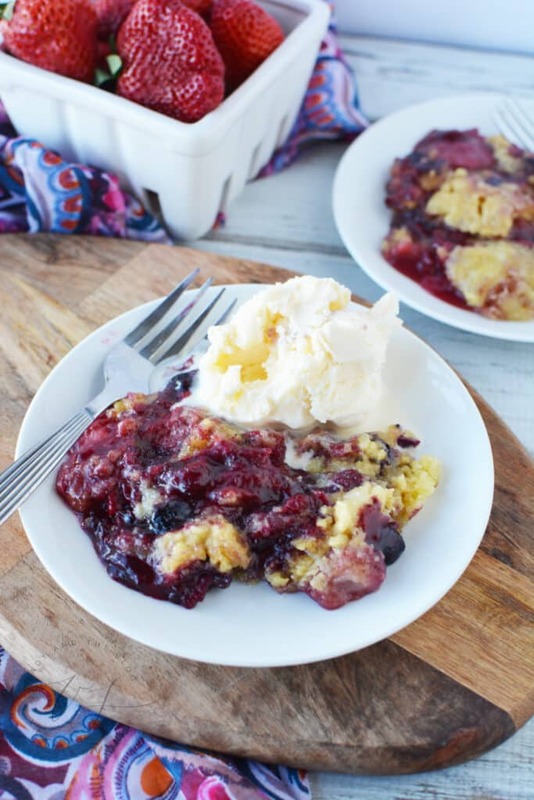 This easy berry cobbler recipe has that old world taste but without all the fuss. To get started, you will naturally need a crockpot. A slow cooker is a woman’s best friend. Honestly! I lean on mine SO HARD these days because there’s something really freeing about throwing a ton of ingredients into a machine and then walking away. Walking a-w-a-y. No stove sitting when there is a crockpot on duty. A literal life saver – especially on those days when I have SO much work to do and not enough time. 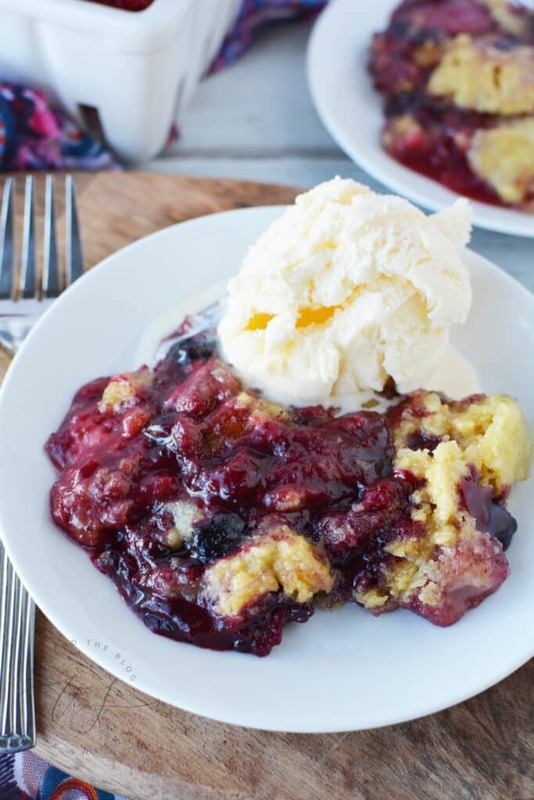 If you want to surprise the kids with a little something sweet after dinner, a berry cobbler will certainly hit the spot. A note about the size of the cake mix. Be sure to use a 9-ounce cake mix while making this berry cobbler. This recipe is crafted with that size in mind. Your typical boxed cake mix is much larger. 1 package, 12 oz, frozen mixed berries (strawberries, blueberries, red and black raspberries) Keep frozen. Spray your slow cooker with nonstick cooking spray. 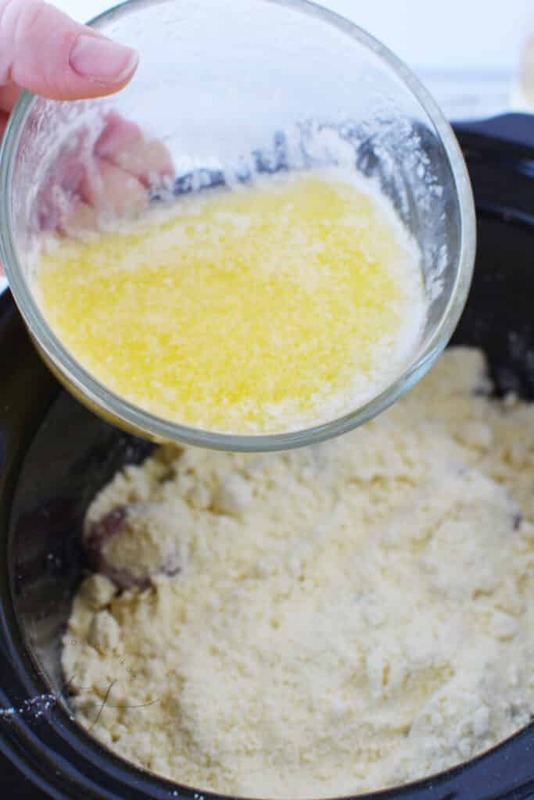 We’ve made this recipe before and have done it without the nonstick spray and noticed that there can be parts of the cake that starts to burn – the edges specifically. A quick spray can eliminate this issue. Make sure you cover all around your crockpot. 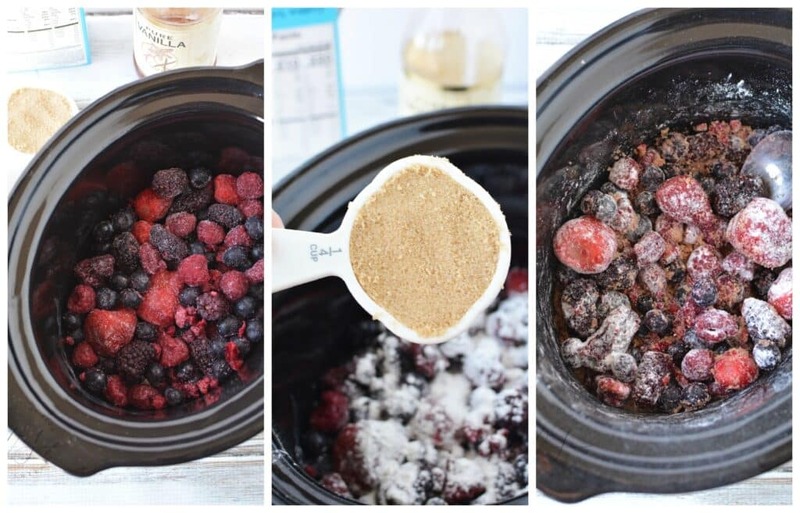 Place your frozen berries into your slow cooker. Add the cornstarch and mix well. Stir in your brown sugar, cinnamon, and vanilla and mix well to evenly coat. At this point, you will want to sprinkle in your cake mix all over on top. Next up, drizzle in your melted butter. Place the lid on the slow cooker and cook on high for 2-1/2 to 3 hours. 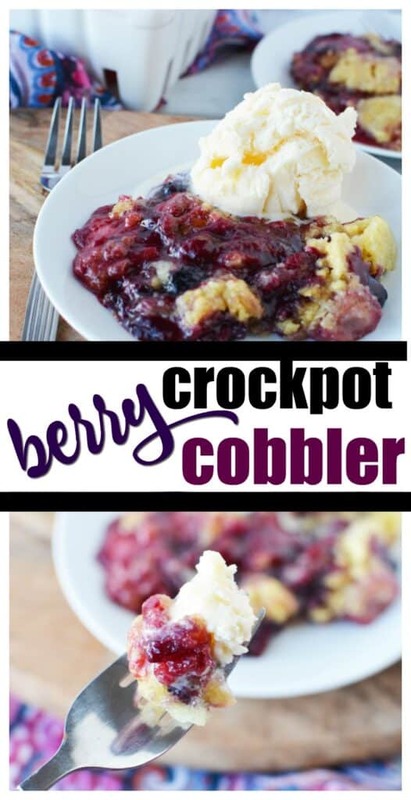 How will you know when your cobbler is done? Cooking is usually done when the cake begins to brown on the edges and/or pull away. When you see this happen, turn off your slow cooker, Open the lid and allow to cool for about 20 minutes. Serve warm with vanilla ice cream. Looking for more recipe ideas? 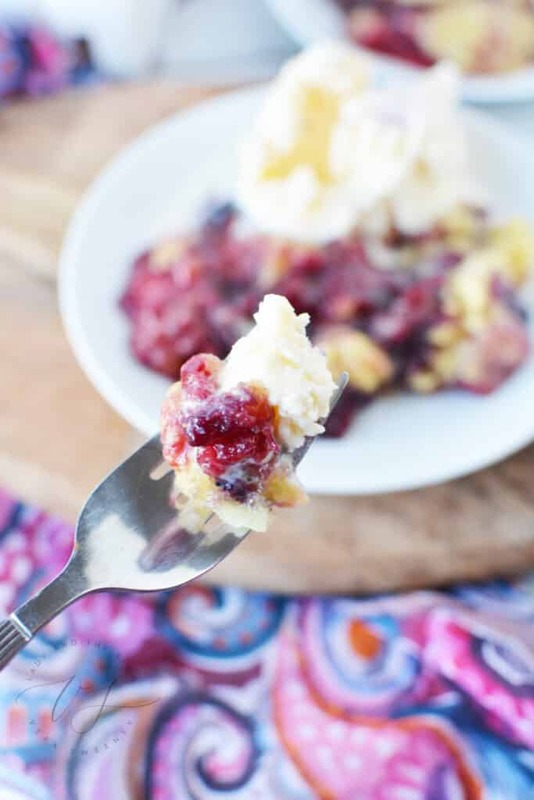 How about this Fresh Strawberry Cobbler Recipe? Or keep it simple with my Slow Cooker Applesauce Recipe. Better yet, you could always try my Cookie Cheesecake Bars Recipe! 1 package 12 oz, frozen mixed berries (strawberries, blueberries, red and black raspberries) Keep frozen. Spray your slow cooker with nonstick cooking spray. 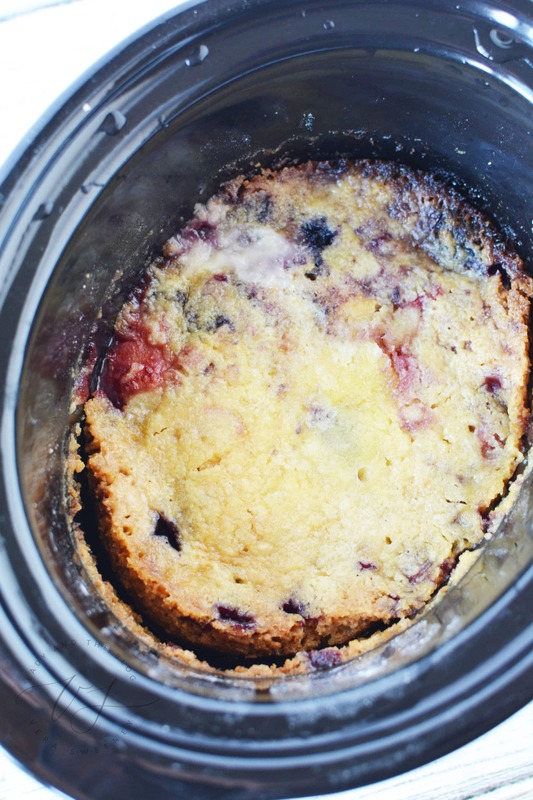 We've made this recipe before and have done it without the nonstick spray and noticed that there can be parts of the cake that starts to burn - the edges specifically. A quick spray can eliminate this issue. Make sure you cover all around your crockpot.